While Europe debates whether animals are entitled to constitutional rights like human beings, here in America we are debating the constitutional rights of human beings dressed like animals. The latest dispute over advertising in the form of "mobile signs" or "mascots" is taking place in Woodland Park, Colorado, where the city council is threatening to outlaw Chicken Man. Chicken Man is the mascot for Wild Wings ‘n’ Things, a restaurant chain based in Colorado Springs. For years, free-range Chicken Men have roamed Colorado streets, alerting motorists and others to the availability of wings (and, apparently, things) as well as beer or another beverage of their choice. And one also patrols beside U.S. Highway 24 in Woodland Park — for now. Saying that Chicken Man violates a local sign ordinance, the city council told restaurant owner Lisa Branden that she would have to bring him indoors. 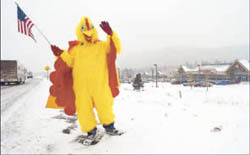 (Allegedly, city manager David Buttery said that the laws are designed to maintain the town’s "mountain grandeur" by prohibiting "signs" like Chicken Man, although he has since denied saying that.) Branden has refused, saying it would harm her business which is located some distance from the highway. The city has said it will not enforce the ban for now, while it works to revise the law. Currently, the law says nothing about mascots but does say that "All signs not expressly permitted or exempted from this regulation are specifically prohibited." That may very well be specifically unconstitutional. In the meantime, Branden has equipped Chicken Man with an American flag instead of the sign he normally waves, but he is still out there. Public opinion seems to be firmly in favor of Chicken Man. He has appeared on the front page of the local newspaper twice and Branden has collected 1,100 signatures on a petition in support. Nearby businesspeople clearly supported the Man. "He’s not a threat to anything," said the owner of PDQ Mail and More. "He’s not a danger to anybody. Leave the Chicken Man alone." Tom at Great Clips for Hair thought the council was being "ridiculous" and that Chicken Man suited the town. "It’s a funky town. It’s a funky chicken." About 80 citizens showed up for a city planning commission meeting last week, at which the proposed new sign ordinance (featuring 18 pages of regulations) was to be discussed. Many wore T-shirts saying "Don’t Choke Our Chicken." Chicken Man, who also attended, needed no T-shirt but brought his American flag along. Apparently, the new proposal, among many other things, specifically defines costumed characters as "temporary signs" and says they would only be permitted for 90 days a year. If the new regulations are approved by the committee, a decision is expected from the city council by late February. If they outlaw Chicken Man, they will be made fun of here shortly thereafter.